Mail International hold a number of accreditations and memberships, find out more about these below. Mail International are a long standing fully accredited member of the Direct Marketing Association UK (DMA). The Direct Marketing Association UK is Europe’s largest trade association in the marketing and communications sector and all members must adhere to a strict code of conduct backed by compliance audits. The DMA was formed in 1992, following the merger of various like-minded trade bodies, forming a single voice to protect the direct marketing industry from legislative threats and promote its development. As a member of the Royal Mail Partners in Quality scheme, we commit to producing mail in accordance with Royal Mail’s core quality standards and measured performance criteria. As part of the scheme we endeavour to work with Royal Mail in order to promote mail as a marketing medium. The Federation of Small Businesses is the UK’s largest organisation lobbying on behalf of and working for small businesses. ISO/IEC 27001:2013 specifies the requirements for establishing, implementing, maintaining and continually improving an information security management system within the context of the organisation. It also includes requirements for the assessment and treatment of information security risks tailored to the needs of the organisation. 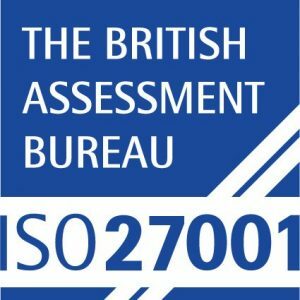 The requirements set out in ISO/IEC 27001:2013 are generic and are intended to be applicable to all organisations, regardless of type, size or nature. ISO 14001:2015 sets out the criteria for an environmental management system. It maps out a framework that a company or organisation can follow to set up an effective environmental management system. It can be used by any organisation regardless of its activity or sector and provides assurance to company management, employees and external stakeholders that environmental impact is being measured and improved. The ISO 14001:2015 standard and the wider developed by ISO Technical Committee ISO/TC 207 and its various subcommittees. There are currently ISO 14001 certifications in 171 countries around the world, demonstrating its global standing. The Mail Distribution Accreditation Scheme (MDAS) is a quality standard, specifically developed to test the procedures and processes of magazine and direct mail production and distribution. The scheme’s objective is to generate customer trust and confidence in the field of both international and domestic mail distribution. Launched in 2009, the scheme was commissioned by the PPA and designed in consultation with both end customers and the Mail Consolidators Association (MCA). MDAS is process-based, with audits, site visits, checks and measurement. Accredited companies must pass an audit on how they handle, process and produce both international and domestic mail. The accreditation is renewed annually premised upon successful compliance and having had our performance measured by client audits and customer satisfaction surveys. In December 2014, we were proud to be awarded 1st place for overall customer satisfaction following the yearly customer audits and surveys which are conducted independently by IMDAS. The MCA acts as a forum for information sharing and joint initiatives – enabling it’s membership to work together to secure and develop the future of the international mail consolidation industry for the mutual benefit of members and their customers. In meeting these aims and objectives the MCA seeks to encourage growth and profitability of the industry.